To ensure that people are treated equally and fairly before the law by educating policymakers and the public about the importance of civil legal aid in our communities and advocating for sufficient public funding for civil legal aid on behalf of low-income people in Washington State. The EJC was established in 1995 to serve as a strong voice to advocate for adequately funding civil legal aid programs in Washington State. We’re a non-partisan grassroots organization and serve as a standing committee of the Washington State Supreme Court’s Access to Justice Board. We work at the local, state, and federal levels to ensure low-income people have access to legal help, assistance, and representation. Members are updated on important legal aid issues through Action Alerts and our blog, which spotlights the impactful work of our partner organizations and champions for legal aid. As the Communications and Advocacy Director of the Legal Foundation of Washington, Will oversees messaging and outreach and staffs the Equal Justice Coalition. More than 70% of low-income Washingtonians experience at least one civil legal problem each year, but only 24% are able to get legal help. The 2015 Civil Legal Needs Study Update documents the growing and critical need for civil legal aid. Washington State’s legal aid network, known as the Alliance for Equal Justice, is comprised of statewide and specialty legal aid organizations that work collaboratively with 17 county-based volunteer attorney programs to provide low-income people with access to justice. The Northwest Justice Project is Washington’s largest, publicly funded civil legal aid provider. In 2015, NJP closed a total of 14,858 cases, directly benefiting 32,978 low-income people in need of civil legal services. Regional Offices: 17 regional offices provide extended legal advocacy and representation in the most pressing and difficult cases facing low-income people across the state. CLEAR (Coordinated Legal Education Advice & Referral): Washington’s statewide, toll-free, legal assistance hotline provides centralized client screening, including online intake, for Alliance-wide legal aid providers. Special Services Units: Addressing particular legal problems or the needs of specific vulnerable communities – Foreclosure Prevention Unit, Foreclosure Consequences Advocacy Team, Medical Legal Partnerships, Veterans Project, Reentry Initiated through Services and Education (RISE) Project, Integrated Rural Legal Assistance Project, Farm Worker Unit, and Native American Unit. WashingtonLawHelp.org: Online self-help center containing hundreds of legal resources, forms and instructions (in multiple languages), including document assembly technology, and educational videos. If you are seeking legal help, call the Northwest Justice Project’s CLEAR hotline at 1 (888) 201-1014. The CLEAR hotline is open from 9:15 a.m. to 12:15 p.m., Monday through Friday. 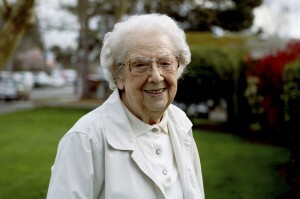 If you are a senior, call 1-888-387-7111. If you are a veteran, call 1-855-657-8387. If you are a resident of King County, call 211 or 1-800-621-4636 (toll free). If you need help with a foreclosure case, call 1-800-606-4819. The Equal Justice Coalition does not provide any legal advice or representation. Instead our efforts go to helping retain and gain adequate funding for legal aid programs in Washington State. Established in 1974, the Legal Services Corporation (LSC) promotes equal access to justice by providing federal funding grants to 134 nonprofit legal aid programs across the United States. Northwest Justice Project is Washington State’s LSC grantee. Federal funding for legal aid has dropped significantly over the years. In Fiscal Year 2010, LSC funding peaked to $420 million, which provided NJP with a $6.8 million grant. Between FY 2010 and FY 2017, LSC funding has decreased by roughly 14% (adjusted for inflation), which has resulted in a reduction of funding for NJP and, subsequently, a reduction of services for low-income people in need of legal aid. On March 16, 2017, the Trump Administration released its initial FY 2018 budget that included the complete elimination of the Legal Services Corporation (LSC). Fortunately, there is strong bipartisan support for LSC in Congress, and the likelihood of the elimination of LSC is small. For the FY 2018 budget, the EJC joined organizations across the country in advocating for $450 million for LSC. 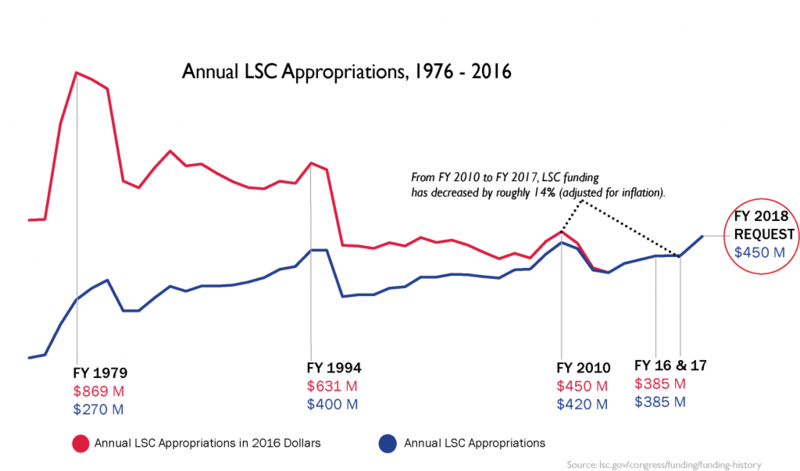 However, as of January 2018, Congress has yet to pass a FY 2018 budget and is currently operating under a Continuing Resolution, extending the current appropriation of $385 million for LSC. For the 2013-2015 Washington State budget, the Office of Civil Legal Aid (OCLA), which funds NJP, received the same level of funding that the Legislature provided in the 2011-2013 biennium – $23.186 million. Early in the 2013 session, the Senate Ways & Means Committee proposed a $5.4 million cut to OCLA. Thankfully, Senators Linda Evans Parlette (R-Wenatchee) and Ed Murray (D-Seattle) co-sponsored a last minute, bipartisan amendment to restore $2 million of the $5.4 million cut to OCLA. This amendment was adopted as part of the Senate-proposed budget. However, the EJC did not stop there. We, after months of hard work, were able to erase these cuts completely. At a time when budgets were slashed for many entities, this result was a relief for the thousands of low-income people that depend on legal aid to secure justice and meet fundamental human needs. Without the help of our members, their calls and emails to legislators, none of this would have been possible. Our collective voice, commitment, and willingness to contact our legislators about the importance of legal aid to low-income communities created this successful outcome. During the 2014 legislative session, the EJC successfully communicated the need for funding OCLA. Thanks to our efforts, the Legislature passed a one-time appropriation of $280,000 to replace and upgrade the antiquated technology of NJP’s statewide legal aid hotline – C.L.E.A.R. C.L.E.A.R. serves as Washington’s gateway for thousands of low-income people to secure legal representation, advice, and referral. During the long 2015 legislative session that has lasted roughly six months and has required three special sessions, our elected officials grappled with extremely challenging issues, such as funding K-12 education, pay raises for state employees and teachers, and a statewide transportation package. In the midst of all of this, the EJC and its supporters worked hard to obtain a much needed increase for civil legal aid funding, as the need for legal aid services in our state has never been greater. Thanks to the efforts of civil legal aid advocates, the Office of Civil Legal Aid (OCLA), which administers and oversees state legal aid funds, received baseline funding from the previous budget plus a $718k maintenance increase (i.e. vendor rate adjustment). This level of funding will help the Northwest Justice Project (NJP) offset the increased cost of services, thereby avoiding potential service reductions. The total budget for civil legal aid services for the next two years, including the maintenance increase, is approximately $23 million. In a year when several state programs were cut and our elected officials struggled to agree on a revenue package, OCLA received a maintenance increase. • Senators and Representatives signed onto letters in support of increasing funding for civil legal aid. • Senators Steve O’Ban (R-28) and Cyrus Habib (D-48) co-authored an op-ed in the Seattle Times about the importance of civil legal and why the state should prioritize investing in legal aid services. • Representative Zack Hudgins (D-11) introduced an amendment in the House Appropriations Committee to provide OCLA with a one-time increase of approximately $2 million. The amendment passed out of committee and was even included in an earlier version of the House’s budget. Unfortunately, that funding level did not withstand the negotiation process and OCLA didn’t receive that increase. Around 7 p.m. on Tuesday, March 29th, the Washington State Legislature passed the 2016 Supplemental Budget and adjourned the Supplemental Session later that night. The budget, which adds $191 million of new spending to the 2015-2017 biennium, passed with a 27-17 vote in the Senate and 78-17 vote in the House. Thanks to the advocacy efforts of civil legal aid supporters, the Supplemental Budget includes $552,000 for the Office of Civil Legal Aid (OCLA), which administers and oversees state funding for legal aid. OCLA requested $555,000 in the Supplemental Budget to cover unanticipated health care premium increases and non-personnel costs of its contractor the Northwest Justice Project (NJP). Without this funding, NJP would have been forced to reduce personnel and client service, with potentially devastating impact on our state’s already strained and overwhelmed legal aid system. For more details, check out this one-pager produced by the Equal Justice Coalition. Funding OCLA’s request was of vital importance and it is heartening that whether Democrat or Republican, House or Senate members, our elected officials all agreed it was the right thing to do. Other issues were more contentious, but ultimately the negotiated budget increased funding to several key areas including:$28 million for safety improvements at the state’s mental health hospitals; $7 million for recruiting new public school teachers and retaining existing ones; $190 million from the state’s emergency fund to address damages from the last round of wildfires; $15 million to expand programs that combat homelessness; and, $8 million to backfill tuition cuts made to state colleges and universities during the 2015 session. Now that the Supplemental Session has adjourned, legislators are able to resume raising money for their re-election campaigns. In 2016, all 98 seats in the House of Representatives and 26 out of 49 seats in the Senate are up for election. Currently the House is majority Democratic, but by a slim margin of 50 to 48. The Senate is majority Republican, by a margin of 25 to 24. The November 2016 elections are incredibly important as they have the potential to bring substantial change to the composition of the Washington State Legislature. We are fortunate that funding of civil legal aid is not a partisan issue and we must work during this campaign season to strengthen support among legislators and candidates regardless of their party affiliation. During the 2017 Legislative Session, the Washington State Legislature increased funding for civil legal aid by $4.8 million! While we all know that this increase is not enough to ensure meaningful access to justice for all Washingtonians, it is a much needed step in the right direction. And, the Legislature noted in its budget bill that this appropriation was “to partially implement the civil justice reinvestment plan,” indicating their recognition of the need for additional revenues in the future. After a long six-month legislative session, the House and Senate finally agreed on a Fiscal Year 2017-2019 operating budget on Friday, June 30, 2017. Late that night, Governor Inslee signed the budget to narrowly avoid a partial government shutdown. In a budget year when legislators struggled with issues such as education, mental health, and transportation, to receive a $4.8 million increase for legal aid (roughly a 20% increase in funding) is a gratifying result. • Provide Northwest Justice Project attorneys with long overdue cost of living and salary adjustments. • We have built momentum for securing additional funding for civil legal aid down the road. None of these successes would have been possible without your continued support, commitment, and willingness to speak out for equal justice. Together, we’ve accomplished a lot and we’ve laid the groundwork to continue this effort in future years. Through education and advocacy, we will continue to make progress to achieve equal access to justice for low-income families and individuals in our state. The Legislature increased the budget for civil legal aid by $638,000. This increase will fund five new civil legal aid attorneys and an automated family law document assembly system. Bottom line: more people will have access to the civil justice system because of this new funding for civil legal aid. While we are pleased with every increase in funding, the reality is we still face a significant gap between the need for civil legal aid and our ability to serve those who need it. We expect to ask legislators next session (which is a full budget year) to fund a significant increase for civil legal aid. Your continued commitment to contacting your legislators today helps lay the groundwork for success next session. HB 2308: Removes many limitations on use of state money for civil legal aid, meaning state funds may now be used to assist clients on critical issues, such as consumer financial protections, medical debt, employment issues, and discrimination. HB 1783: Makes a major change to one of the biggest barriers to re-entry for individuals who are incarcerated by eliminating interest accrued on legal financial obligations (LFOs) during incarceration, providing LFO repayment plans, and limiting courts from arresting individuals who cannot pay their LFOs. HB 1831: Raises the asset limit eligibility requirement for families applying for state public assistance, such as Temporary Assistance for Needy Families. Now, families can have $6,000 in savings and a car valued up to $10,000, allowing families to obtain temporary assistance without losing all of their assets and burying themselves further in debt. SB 6002: Mandates equal voting opportunities for traditionally marginalized communities and provides avenues for communities to challenge offending cities or counties that don’t comply. HB 1506: Requires employers to pay the same rate for the same work regardless of gender. HB 1239: Ensures free access to personal health care records for individuals appealing their case after being denied disability benefits. Between Fiscal Year 2008 and Fiscal Year 2012, King County’s investment in legal aid has decreased by a cumulative of nearly $160,000. For the Fiscal Year 2013 budget, the EJC faced multiple challenges: (1) our goal was to restore funding to pre-recession levels; (2) The King County Executive’s budget included only four of the five programs supported in fiscal year 2012; and (3) we were attempting to expand King County’s support to include Seattle Community Law Center, an Alliance member working to secure federal benefits for people with disabilities who are homeless or low-income in King County. The EJC attended and testified during community hearings on the proposed budget and met with Councilmembers (and their staff) to discuss the collaborative delivery system of the King County legal aid providers that works to ensure the needs of low-income people are met in a timely and effective manner and to illustrate the need for restoring and expanding funding for legal aid. The King County Council did more than champion our ask. They passed a budget that restored funding to pre-recession levels for Eastside Legal Assistance Program, Northwest Immigrant Rights Project, TeamChild, Solid Ground – Family Assistance Program, and Unemployment Law Project; added Seattle Community Law Center to the budget; and secured additional funding for ELAP to provide a Domestic Violence Attorney at the Domestic Abuse Women’s Network (DAWN). Legal aid funding from the King County budget increased from $302,000 to $513,991. For the Fiscal Year 2014, we successfully secured a continuation of levels seen in the King County’s FY 2013 budget, which included a sizable increase in investment to legal aid programs serving King County’s most vulnerable people. In 2014, the King County Council moved to a biennial budget cycle. The EJC worked with our supporters and the six King County legal aid providers that receive County funding to successfully maintain funding levels from the previous budget, including a vendor adjustment increase. For the County’s first biennial budget, FY 2015 – FY 2016, legal aid is funded at $1.05 million shared by six organizations. On August 31, 2016, the Health & Human Services Committee of the King County Council reviewed a proposal developed by the King County Department of Community and Human Services to create a new funding allocation methodology for civil legal aid. The proposed methodology designates 90% of the County’s legal aid dollars to the organizations that are currently receiving County funding (Eastside Legal Assistance Program, Northwest Immigrant Rights Project, Seattle Community Law Center, Solid Ground – Benefits Legal Assistance Program, TeamChild, and Unemployment Law Project), and the remaining 10% would be opened up to other organizations through a competitive RFP process. Later in the year, the full Council adopted the proposal. The King County Executive released his 2017-2018 budget at the end of December. Funding for civil legal aid is flat, but includes a small cost of living increase for both 2017 and 2018. For more information about civil legal aid or the EJC, get in touch with us. If you are seeking civil legal help, please call Northwest Justice Project’s CLEAR hotline at 1 (888) 201 1014.